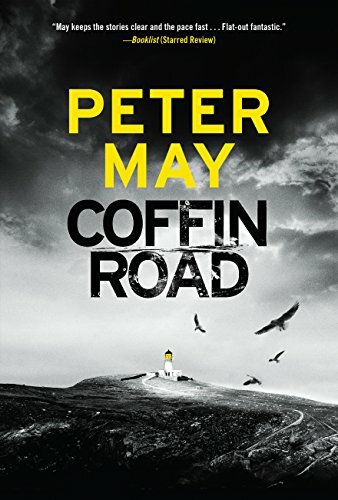 I’ve become a fan of Peter May’s novels, so I bought Coffin Road, even knowing that the subject matter wouldn’t make me entirely happy. It’s pretty much what I expected. A well-written, thoughtful novel promoting a cause about which I have doubts. At the beginning of Coffin Road, the main character/narrator (author May has an interesting technique of describing the narrator’s action and thoughts in the present tense, then switching to past tense when jumping to other characters) finds himself washed up on a beach on the island of Harris in the Hebrides. He is soaked through and on the verge of hypothermia. But what troubles him even more is the fact that he can’t remember who he is, or how he got into this situation. Through a lucky meeting he finds his way back to the cottage where he’s been staying, but he still can find no clue to his identity or what he was doing renting the cottage. This in itself is suspicious and troubling. Gradually he learns that he was involved in some kind of research involving bees. But he can’t find any equipment or records. Following a clue, he takes a boat to a nearby island, where he finds a murdered body in a lighthouse. Terrified that he is himself the murderer, he flees the scene, but that doesn’t keep him from police suspicion. The story is well-told, and the tension rises and the stakes get pricier as we go along, just as they ought. The narrator’s meditations on the subject of identity and memory are well thought out and intriguing. My only real problem with the novel is that it’s a message story, promoting the argument that modern pesticides are killing off bee populations, and that human life itself is endangered by the greed of the agribusinesses. I’ve never been inclined to believe that corporations really think they can earn a profit from global depopulation and environmental devastation. This article from the Washington Post argues that the threat, though not imaginary, has been exaggerated. I don’t know. Maybe the Post writer is in the pay of the big corporations. Or maybe May is in the pay of the environmental lobbies. You’ll think what you like about that issue. Aside from that, this is Peter May doing what he does so well. His vivid evocations of the storm-lashed Hebrides are, as always, one of the great rewards enjoyed by the reader. Adjusting for political quibbles and my own prejudices, I otherwise recommend Coffin Road. Cautions for adult language and situations. I’ve never been inclined to believe that corporations really think they can earn a profit from global depopulation and environmental devastation. Thank you. It’s nice to have someone say it. With my Scottish ways I’ve got Coffin Road on hold at my local public library. I’ve enjoyed every word penned by Peter May. I’m pleased you read him at my recommendation. One of the things I liked about the late Michael Crichton was his outspoken opposition to the environmental/climate change bullies.